PARAQUITA BAY, Tortola, VI - Deputy Premier Dr the Honourable Kendrick D. Pickering has announced that Government is embarking on a major project to increase the agriculture sector for the Virgin Islands. Speaking at the launch of Farmers' Week 2013 at Paraquita Bay today, February 1, 2013 hon. Pickering also alluded to the plans to pursue the greenhouse project but not before carefully reviewing it. "Greenhouse is a project that has to be completed." said Hon. Pickering. He noted that there is likely to be long term challenges if not reviewed carefully. 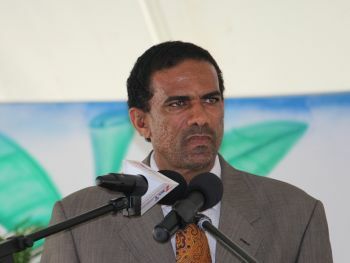 He added that the greenhouses project can produce for economic sustenance for the Virgin Islands. He also announced that Government is working on a major project for a solar farm at Anegada and has engaged the service of an entity that is specialised in the field. "Solar energy is free to us," he noted and said that it can provide 50-60 percent of energy for VI and can be produced at a much cheaper cost than it is today. Instructions were also given to officers to go out and secure land for sheep rearing in Anegada. Hon. Pickering also acknowledged the celebrations of International Wetlands Day which he said is critical to our survival. "There is no beach without a pond.... If we destroy the pond we'll be destroying our beaches. Please remember to protect ponds for economic development and stability." tis foreign hands it was planned for all along w here you live? He is one of the worst offenders. His pet projects have potential of affecting the environment forever. especially beef island. Its a shame he forgot to tell this to his buddy DJ up ONB.....It could have saved DJ a lot of money he spent on importing the beach from Barbuda....and could have allowed him a never ending gold mine of a rare migratory bird habitat to give his high end clients something to look at other than sea and (imported) sand. so true. and don't forget the imported palm trees and the disturbed turtle nests. these people are so short-sighted that they don't know how to honour and work with what they have. Pretty soon everything will look the same concrete and swimming pools. could be anywhere. people who make big statements and then (when the choice is upon them) decide to go with distruction instead of protection are just giving lip service to the masses. He has an commercial agenda, not a sustainable plan. so what if he was in Hog City at lease he was doing something good. Look how much Colorado and California making off growing cannibis. Maybe Omar could see the future and that's why he never used the greenhouses. Now the State's is falling in their war on drugs they let will let other countries legalise. Lets be progressive and get on with it while the herb still has high value cause you know as soon as the US starts farming it commercially the bottom will fall out of the price. Use the greenhouse to grow high quality herb now and we can generate some high grade high paying tourism right now to feed our people and reduce our reliance on funds generated though the diminishing offshore sector. It won't be around forever. Let's respond to market changes. When you done growing your high grade cannabis feed it to yourself and your children. You people who are in favour of the drug trade, sell drugs to other people children and destroy their lives, while you all send your children to best schools, build big houses, buy luxury cars and boats. There are other industries that government can pursue to develop, it does not have to be the drug industry. Greedy people always look for the easy way out. It is the drug trade that is fleeting and not going to be around forever, but anything that is built with hard work, honesty, integrity and perseverance, WILL LAST FOREVER. Go away, we don't need your selfish advice. god bless and keep our nation and all our peoples in it...always...!!! it should be "farmers weak" instead of "farmers week"
Critic you are soooo right. Visit the farms and there is nothing there. Visit the exhibition and the school children out number the produce. There is a whole lot of hard headedness in that Department; but then look who is the Minister. To all of us who are looking for produce from the farmers..why dont we plant something? A sweet pepper, a tomato , an egg plant? Stop complaining and plant.